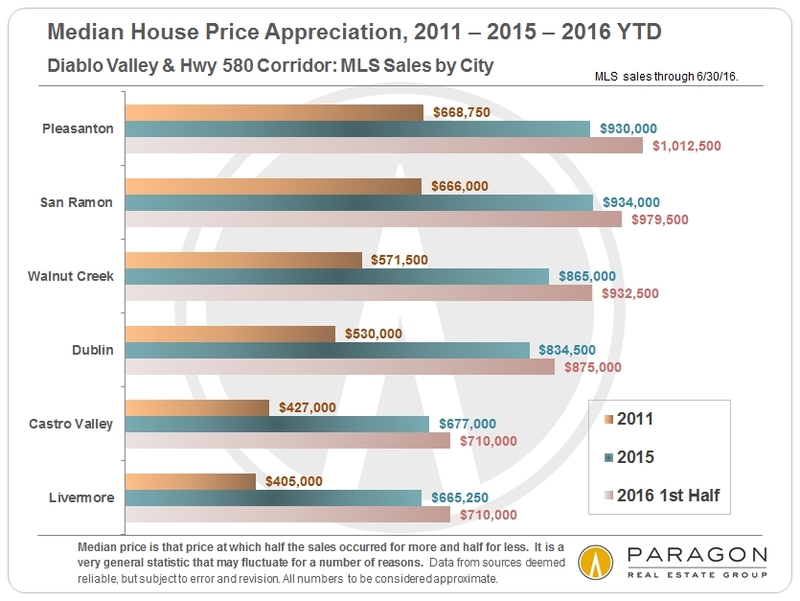 These charts below look at median sales price appreciation 2011 to 2015, a period of very fast home-price increases, and then more recent changes, 2015 through the first half of 2016. 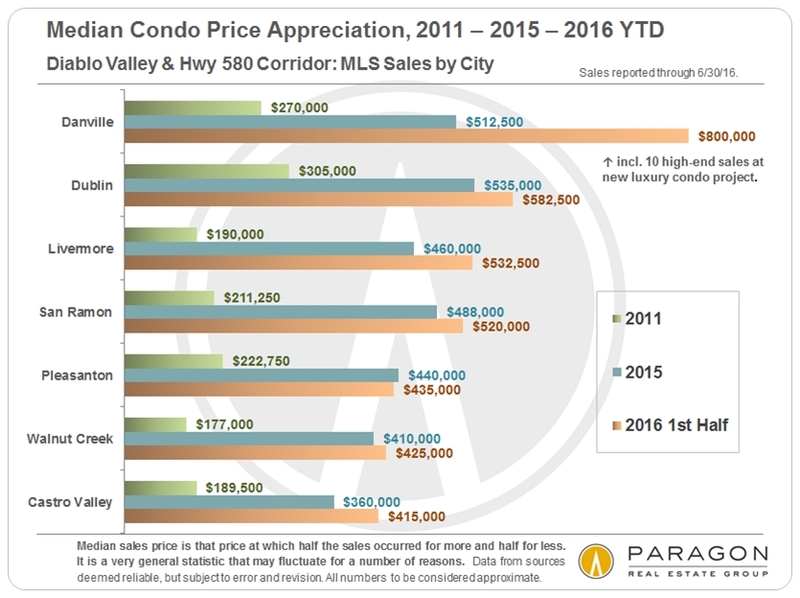 One of the trends that has been showing up recently in Bay Area real estate markets is that homes in the more affordable price ranges have continued to see median sales price increases (sometimes substantial increases), while in the more expensive communities, median prices have generally plateaued, or the rate of appreciation has significantly slowed, or prices have even ticked down a little. Part of this is certainly a (somewhat desperate) buyer search for affordable homes in a general market that has appreciated so rapidly in recent years. 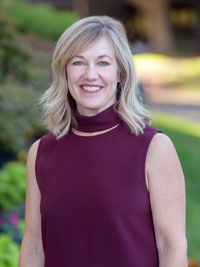 It may also be true that some of the most affluent buyers are choosing to hold off on large purchase decisions because of all the financial market turmoil lately. It may simply have to do with inventory coming on market, or it may be an indicator of a significant developing transition, i.e. buyers have reached a limit on how much they will pay, even for an appealing home. Things should become clearer in the second half of the year. 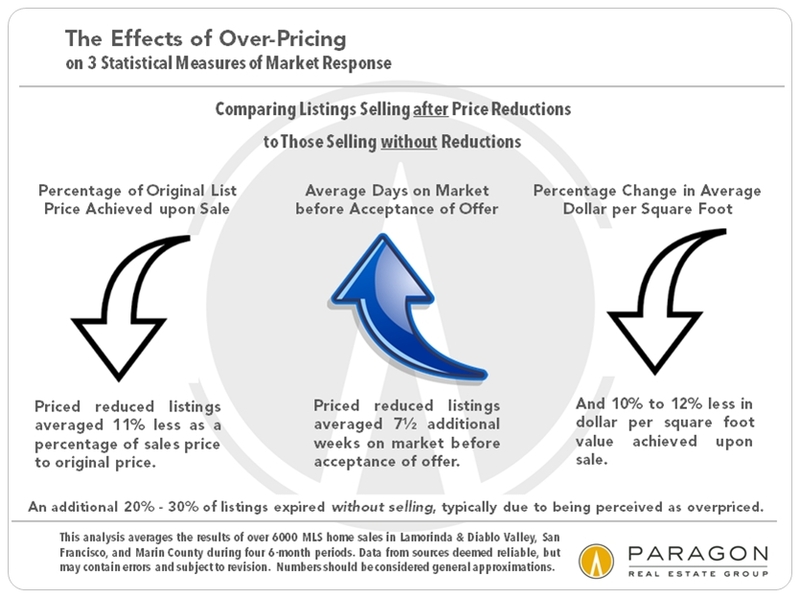 It is impossible to know how a median sales price or median price changes apply to any particular property without a specific comparative analysis. 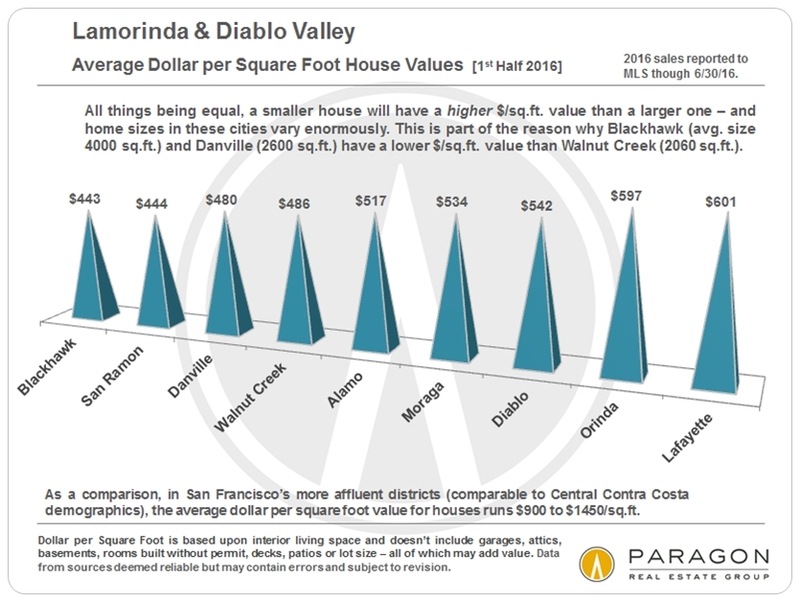 Generally speaking, average dollar per square foot values have continued to increase in 2016 in Lamorinda and Diablo Valley communities. 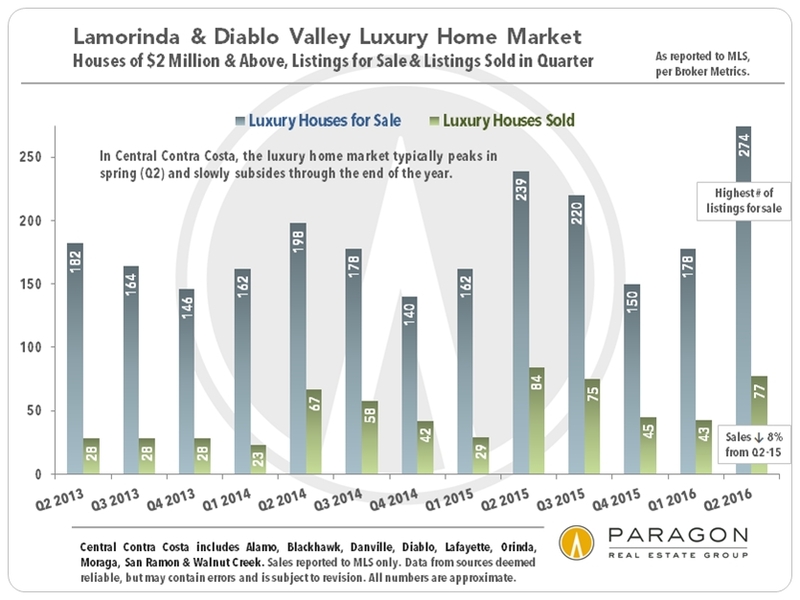 The number of Lamorinda and Diablo Valley homes listed for $2 million and above hit an all-time high in Q2 2016, up 15% from Q2 2015. However, the number of homes selling for $2 million or more dropped 8% year over year, and the number of listings expiring without selling (typically due to buyer unwillingness to meet seller pricing) jumped by 65%. Indeed for every 3 luxury homes that sold, 2 other listings expired or were withdrawn without selling. 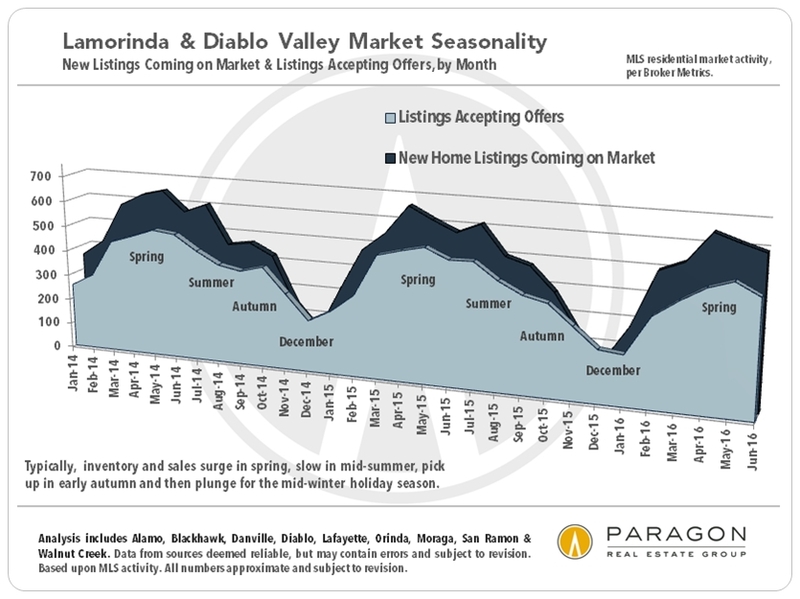 Spring is usually the peak selling season. Typically, market activity slows in July and August before picking up after Labor Day with another smaller surge of new home listings. Then in mid-November, the market begins to go into deep hibernation until stirring to life again in mid-January. The holiday slowdown periods can be excellent times to buy because of the significant decline in competition from other buyers. It is competitive bidding that leads to the highest prices and its absence allows much more scope for negotiation. On the other hand, the number of active listings on the market also drops, which means less choice. Enduring financial market volatility, most recently caused by the Brexit vote in Great Britain, has continued to push mortgage interest rates lower. It is now just above the all-time low hit 3 years ago. 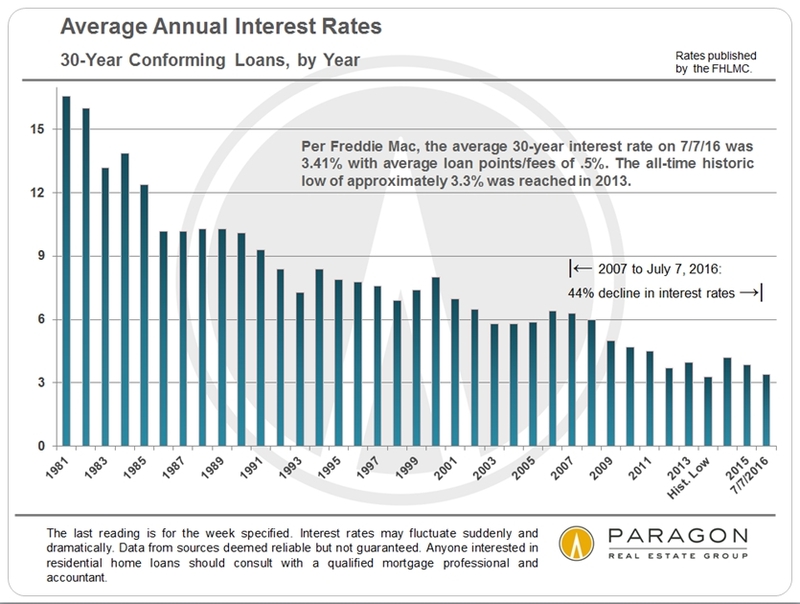 Decreasing interest rates play a big role in lowering ongoing housing costs for buyers (and owners who choose to refinance). For the time being, this is a very good time to get a new home loan. The longer a home stays on market, the less value it holds in the minds of prospective buyers, and the less likely buyers will compete for its purchase. 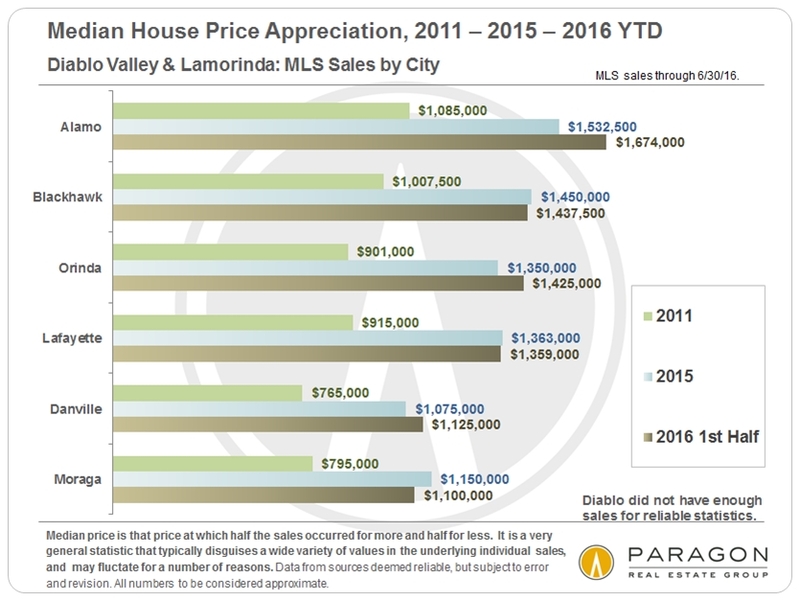 If the Bay Area market is moving into a less heated period of the market cycle, and we believe it probably is (the San Francisco market has definitely cooled in 2016), it is more important than ever not to overprice and waste the optimum period of marketing, i.e. when the home first hits the market and motivated buyers are paying the most attention. Please let me know if you have any questions or I can be of assistance in any other way.